JOURNEY INTO MYSTERY #83 Iconic! Celebrate and own a piece of Avengers History! Original Family Owner, issue bought by my father in his teens. Given to me and mylar bagged in 1987, CGC'd in 2015. 1962 ORIGINAL COPY 1ST APPEARANCE THOR. 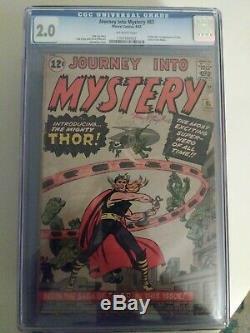 The item "JOURNEY INTO MYSTERY #83 CGC 1962 ORIGINAL COPY 1ST APPEARANCE THOR" is in sale since Tuesday, March 26, 2019. This item is in the category "Collectibles\Comics\Silver Age (1956-69)\Superhero\Thor". The seller is "vichia55" and is located in Newport Beach, California. This item can be shipped to United States.